It was the most highly anticipated moment for Duck fans across the country. Autzen Stadium was shaking from the roar of more than 58,000 people packed in tight to see the season opener. More importantly, to see Vernon Adams in his debut game. 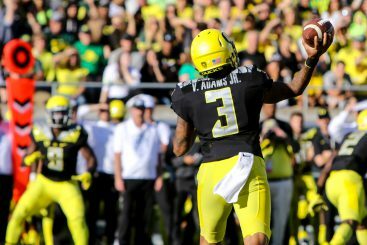 I was fortunate enough to be one of those screaming fans and watch first hand as Adams displayed his skillset that has Duck fans ecstatic for the rest of the season. We watched as Adams evaded defenders, found the second and third option, and kept plays alive a la Marcus Mariota. Yet it was what he said following the game that truly impressed me. In a post game news conference, “Ducks Sports Authority” was able to capture the quarterback’s humility after an extremely impressive debut. It is evident that this grown man is dedicated to his team and strives to get better every day. This is why he came to Oregon. He could have stayed at Eastern Washington and collected more records and accolades but transferring to the Ducks is his chance to compete at the highest level against the best teams in the country. He is very aware of this special opportunity and has vowed to give his best effort. With each week, Adams becomes more comfortable, but this sure was a great starting place. Offensive coordinator Scott Frost was very pleased with his offense controlling the line of scrimmage on their way to 731 yards of total offense. “Ducks Sports Authority” also had the opportunity to hear from the man behind the offensive success. Vernon Adams Jr. was very impressive in his debut for the Ducks. “I thought all of our young backs handled themselves well. You saw flashes from all of them.” Rushing for 485 yards against anyone should be thought of as a little bit more than flashes, but the humility extends further than just the players. Sophomore Royce Freeman continued his success from last year with 180 yards and 3 touchdowns. Freeman is extremely versatile as he can run through you, around you or frankly any other way there is to get by a defender. With so much talent, don’t be surprised when Freeman’s name is on countless award ballots at the end of the season. With Thomas Tyner done for the season, Kani Benoit and Tony Brooks-James showed they are up for the task at RB2. Benoit ran with power gaining 83 yards on 11 carries and scoring the team’s opening touchdown. TBJ showed glimpses of his track speed with 2 touchdowns of his own. Tack on 94 more yards and the elusiveness of Vernon Adams and you have a dynamic rushing attack that should be feared throughout the country. 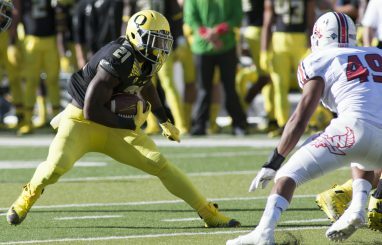 After missing the season last year, the sight of Bralon Addison suiting up for the Ducks created countless ovations. In the first quarter, Addison caught Adam’s first career touchdown as a Duck. Seems like poetic justice with the new Duck throwing to a seasoned veteran Duck. Dwayne Stanford and Byron Marshall looked great in their routes and gained 90 and 69 yards respectively. Royce Freeman dazzled his way to 180 rushing yards and 3 touchdowns. With so much talent on the outside, it’s hard to believe that Charles Nelson, Devon Allen and Darren Carrington all weren’t available. Coach Frost said that he expects Charles Nelson to terrorize opposing secondaries in the near future. With so much WR depth, maybe coaches should rethink the idea of switching him to cornerback after Eastern Washington had much success against the young secondary. Allen looks to return as the speedster receiver but has not set a date for his full recovery from his torn ACL. Carrington still awaits his fate from the NCAA after failing a drug test in December, ultimately missing the national championship game. NCAA laws require he be suspended for half the following season, but the Ducks are appealing that rule. We hope all three players will be able to continue their success from the previous season. Next weekend in East Lansing will be a true test for the Ducks. Yet after hearing from coach Frost and Vernon Adams, the offense will be ready to clash against the Spartan defense. There are few words to describe the feelings you have as you walk inside the gates of Autzen Stadium. I often find myself taking a step back in awe of its grandeur. From Don Essig declaring, “It Never Rains in Autzen Stadium” to The Duck speeding onto the field on a motorcycle, it’s official folks! Get excited because Ducks Football is back! 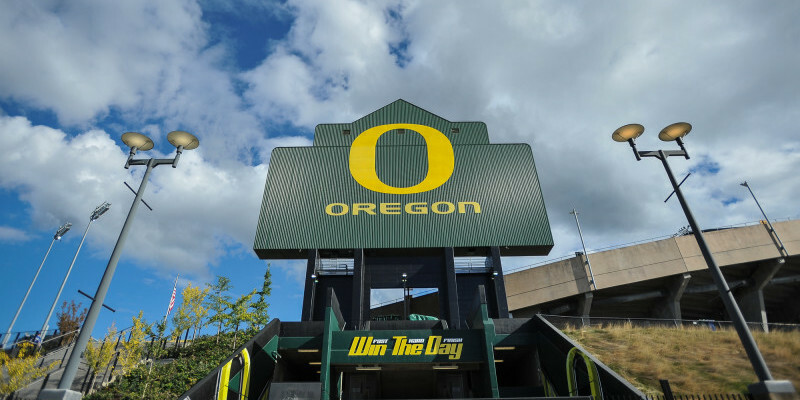 To hear more insightful interviews with the coaching staff and players, or just to stay up to date with all aspects of Oregon football, subscribe to Ducks Sports Authority and join many other Duck supporters. eastern washingtonMichigan StateOregon DucksRoyce FreemanScott FrostVernon Adams Jr.